Love, Fear, Statues of Liberty, angry exes, the broken-hearted, a sock puppet named Howie, and would-be superheroes are some of the characters we meet in the eight plays that comprise the 28th production of Buffalo Quickies, the series of one-act plays presented annually by Alleyway Theatre. Festival Director Joyce Stilson has assembled a talented group of playwrights, directors, and actors. All but one of the plays are world premieres and all are written by local playwrights. In just under two hours, actors laugh at each other and themselves, cry, try to hide but ultimately expose their vulnerability, find their strength, speak their truth, express their confusion, anger, desire, sadness, and dissatisfaction with the status quo, whatever that may be to them. The second act opener, A Work Break Downtown by Jeff Z. Klein, which won the 2018 Maxim Mazumdar New Play Competition, is a standout. The torch-carrying ladies atop the Liberty Building take their break and discuss what they see from their different perspectives after 94 years of standing in the same place. West, played with a delightful sense of naïve wonder by Jaimee Harmon, is ecstatic about the “Renaissance” that is happening in the city. She waxes poetic about bicycle lanes and young couples on double dates going to craft breweries. In contrast, East, played with dry, acidic wit by Shawnell Tillery, has a completely different view. She sees abandoned factories and empty lots and has a few things to say about the Mayor. The writing is sharp and droll, and both women are convincing in their differing literal viewpoints. Ms. Harmon also waxes poetic as the ephemeral Love in Over the Tears by Mark C. Lloyd. In a flowing red gown and sporting platinum curls, she hovers over the forlorn and heartbroken Mike Starzynski who is writing a tear-stained letter. He is so very sad. Can she convince him that love is not gone forever? In One Man Show by Mike Randall, an actor in 18th century attire as Aaron Burr, with Lin Manuel Miranda rapping over the speakers, stands alone on the stage and begins speaking to the audience. A woman emerges from the back of the house and begins to berate him. Who is she and what does she want? Mike Starzynski is excellent as the befuddled actor, and Stephanie Box as the mystery woman is a hoot with her deep Southern accent riddled with hilarious only-in-the-South axioms. Andrew Zuccari is laugh-out-loud funny as the orange-garbed, masked superhero Pylon in The Credible Adventures of Pylon and Thunderthighs by J. Snodgrass. With Shawnell Tillery as the very frustrated and secretive Thunderthighs, the pair break into art galleries and steal “anorexic artwork,” which then mysteriously always gets destroyed before they can sell it. The script could have been tighter with a little less dialogue about those thighs, but it is fun nonetheless. Mr. Zuccari is the holder of the sock puppet, Howie, in Who’s Afraid of Donald Trump? by Justin Karcher, a clever sendup of the Edward Albee play that also stars Stephanie Box as his furious controlling wife, Liz. There is much angst, some of it very confusing, between the two that results in much laughter for the audience. Listen carefully to what sounds like The Byrds' version of "Mr. Tamborine Man" in the background. What did they say? The Arrangement, by Jennifer Tromble, has two couples sitting at a dinner table. 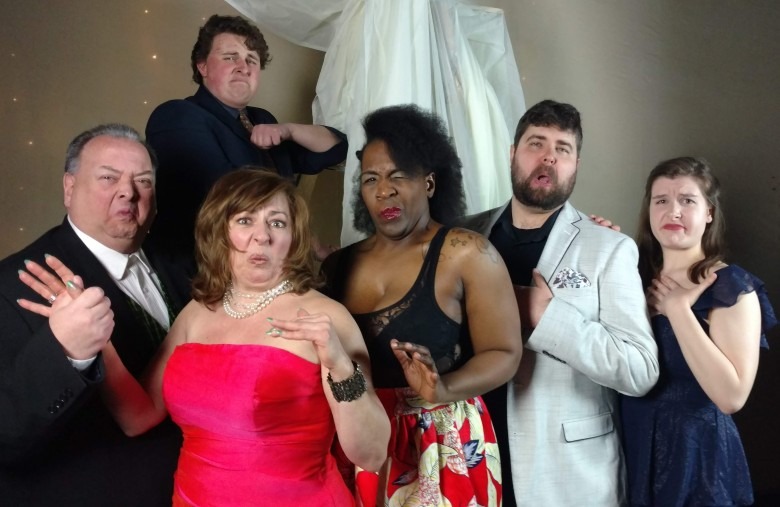 Frank, played with sarcastic frustration by Dylan Brozyn, thinks Tracy’s (Jaimee Harmon) new boyfriend Al (Andrew Zuccari) is an idiot, while Tracy thinks his new girlfriend, Mindy (Shawnell Tillery) is a bore. We find out what this is all about as the evening unfolds into arguments that explore a failed relationship and an unusual arrangement in a comic atmosphere. Starting Out Strong, a two-hander by Samantha Marchant about strangers meeting on a park bench, and Eleven Things That Almost Happened to Rick and Hannah…And One Thing That Actually Did by Bella Poynton, another two-hander, about, well, eleven things that almost happened and one that actually did, round out the plays. Many of the plays hold surprises for the audience as to what is really going on. The acting is strong, the plays are entertaining, and the evening is short and sweet. What more could one ask for from an evening of quickies? 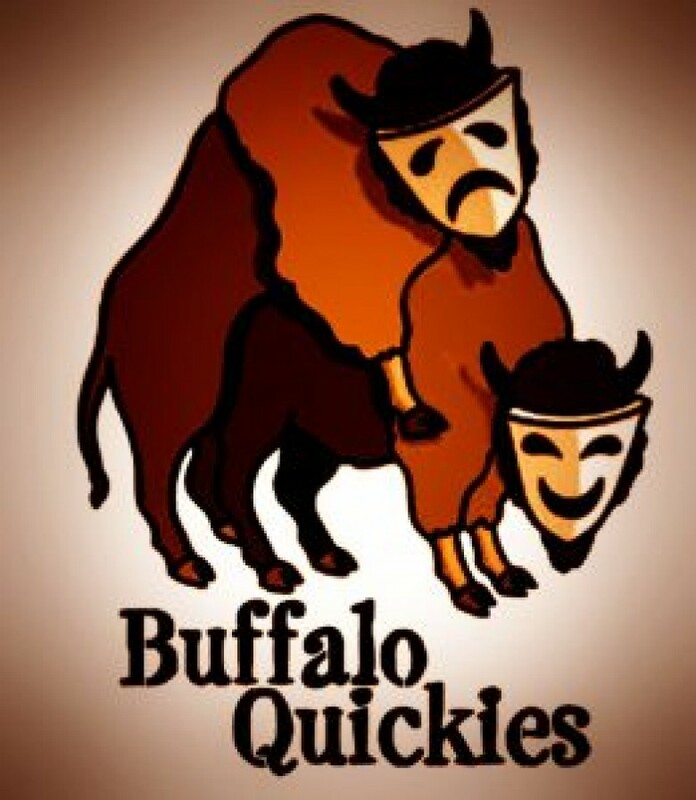 Buffalo Quickies may be seen at Alleyway Theatre through May 4th.